With The Blacklist, Red and Elizabeth used to be incredibly boring, as the constant questioning of what their relationship is became far too obnoxious. Lately, these two have been the most interesting elements to this show, which doesn’t so much say that they’re becoming more interesting, but rather than everything else in the show is just massively mediocre. “The Judge” is about a person who seeks revenge for prisoners who have been wrongfully imprisoned. The plot isn’t really that interesting, even though Dianne Wiest ends up being the title character and is wasted in a thankless part. In fact, almost every episode of The Blacklist suffers when focusing on the member of the actual Blacklist. At this point, all that really matters are the stories of Red and Elizabeth, yet rarely does an episode focus on them. 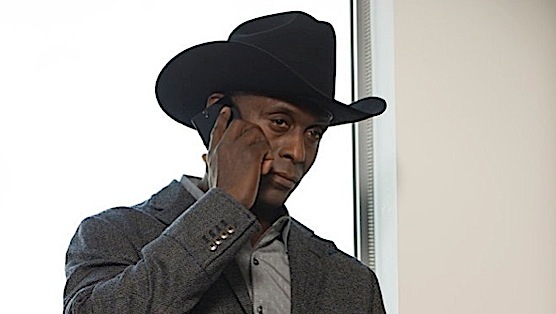 At the very least, ‘The Judge” introduces my favorite character on the show, which is just Lance Reddick in a cowboy hat. That’s all I need to deem him the best character here. Cowboy Reddick is working with Reddington to do a background search on Jolene Parker, otherwise known as the woman trying to seduce Tom Keen. She’s actually been following around Reddington, before her latest mission of following around Tom. Speaking of Tom, he’s also becoming interesting for once. We finally see that he isn’t who he claims to be, playing the part of the loving husband since he claims it is his job. But if this is a his job, is he really succeeding at it? I mean, he left his wife to go to Orlando with another woman, making her slightly worry, and now he’s cheating on her. Doesn’t sound like he’s really doing a good job at all. Besides trying to call Tom one time, Elizabeth doesn’t actually seem all that worried that her husband went to a teaching conference on the other end of the coast out of anger over their relationship. She’s once again too busy trying to solve the case of the week that isn’t really relevant to the overall story. Reddington seems to know what Parker is up to, since he claims to know exactly where she is at the moment and what she’s doing, so Parker and Tom can’t be that much of a problem, or he just flat out doesn’t care. Reddington also claims that there is a war coming, which didn’t we just deal with a war that involved their compound being attacked and several moles? The last war came and went without much of a problem, so this upcoming one shouldn’t be much of a problem, either. The Blacklist has become so bland from episode-to-episode that the most problematic characters and plots have actually become the most compelling. That’s not a good sign for the larger story of The Blacklist, especially when it so casually wastes actors like Wiest and makes a majority of each episode so boring and inconsequential.